There are several ways to travel in Thailand, but bus is the most accessible and highly-demanded mode since bus ticket is cheap, frequent and convenient no matter where you will go. One of bus companies that will pop up in your search results when you are looking for trips between Bangkok-Pattaya, Bangkok-Hua Hin, and Pattaya-Hua Hin is Bell Travel Services. This Thailand bus operator, based in the Bang Na District, Bangkok was established in 1995 has made itself famous bus company with their shared and private transfer services over the years. Nowadays, with the proliferation of smart phones technology travel plans could be made easier by booking your Bell Travel bus ticket online through Easybook's website. Bell Travel Services also travels from Bangkok to Suvarnabhumi International Airport, Pattaya and Hua Hin, to various hotels as pick-up and drop-off points in Bangkok and Pattaya towns for your convenience. 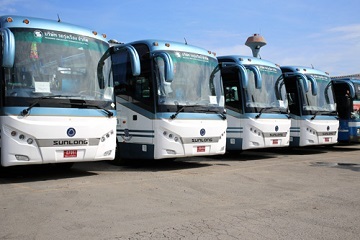 Bell Travel Service provides very well-maintained 38-seater, 43-seater bus coaches and 10-seater VIP vans with emergency safety devices and there is even a toilet on board to facilitate travelers. Moreover, Charter Van is also available at Bell Travel Services if you are travelling with a group of 10 people maximum per an air-conditioned van. We recommend to have less people if you prefer more space for the luggage and to have yourself an enjoyable journey. Professional drivers of Bell Travel Services who obey the safety rules have many years of experience to increase security of passengers. Just seat back and enjoy comfortable and safe ride with us. Passengers of Bell Travel Services can also purchase extra travel insurance in case of an emergency. Vehicle insurance is essential according to the laws in Thailand, so we also cover for the passengers with third party claims. It is always good to be safe than sorry. Whether you are heading to Bangkok for an exhilarating Muay Thai match at Lumpinee Boxing Stadium, Shopping at Paragon and MBK malls, or to Pattaya to witness a rare and breathtaking cinematic live experience at the KAAN Show Theatre, Bell Travel Services will be there for you. You can now book your bus tickets on Easybook's platform whether on laptop, mobile device or a tablet. 321, Bangna-Trad Road, Bangna, Khet Bangna, 10260 Bangkok, Thailand.